Vineet Vemulapally, a biology and business double major, enters his senior year with a 42–14 record in singles play and 43–18 in doubles. 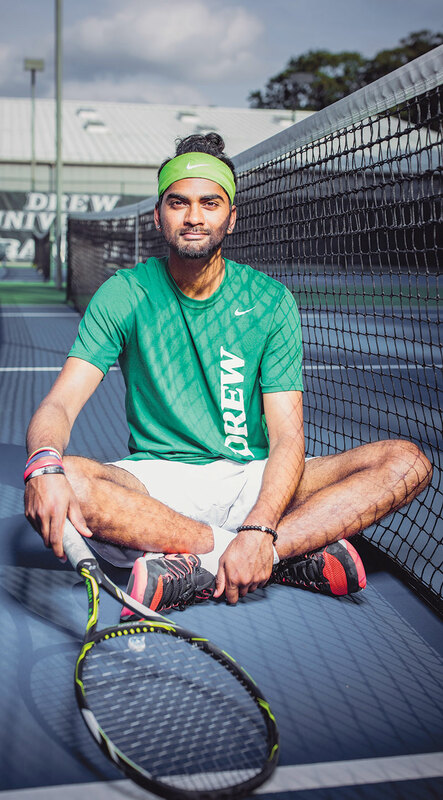 The tennis star muses on his path to med school, his on-court goals and his Drew communities. How has Drew helped you get ready for your next step, medical school? I got a significant amount of attention from my professors, inside and outside the classroom. In many classes we learned more complex lab techniques and information not commonly taught in the same classes at other colleges, which sets me up for a more successful integration into a professional workplace. My adviser, Professor Joanna Miller, was particularly influential. Tell us about your internship at Morristown Medical Center. I spent a semester shadowing the doctors in the emergency department. I watched doctors perform CPR, detoxification of patients and a whole host of other procedures, even end-of-life care. I learned that doctors have to be exceptional in balancing multiple tasks and retaining multiple sets of information so they can rapidly shift gears. After twice making the All-Landmark Conference First Team, twice making the conference Academic Honor Roll and earning the tennis team’s MVP last season, how do you top those performances in your senior year? The best thing for me as an individual is to get the Landmark Conference Player of the Year. As a team, we want to become conference champions, and I think we have a good chance. You’ve received a slew of scholarships at Drew: Baldwin Honors, Sherman Plato Young, Dona and Roland Young, Thomas D. Sayles Jr. Internship and RISE Excellence in Science. How helpful were they in making your time at Drew possible? Without the aid of these scholarships, it’s likely that I wouldn’t have been able to attend Drew. What’s surprised you most about Drew? How close the community is here. I have a community in biology, a community in tennis, a community in my dorm. It’s not something I expected on a college campus. School is just like home to me.